Buying new flooring, whether it's hardwood flooring, vinyl flooring, or carpet, can be daunting. Which flooring option is the best for you? Where do you even start? You can go to a big store where you are just another sale, pushy salespeople, and high prices. Or you can do your shopping online where you can't see or touch the product. But there is another way: Cape Fear Flooring & Restoration! We have a brand new showroom with flooring samples galore! Which means more variety in flooring options and convenience for you - the customer! We carry and store a warehouse full of stock so we have supplies on hand when needed. We also have top-of-class customer service that's here to help you, not sell you things you don't need. Our experts will help you find the perfect flooring that suits your needs, tastes, and budget. Here are a few of the reasons why you should visit us first for all your flooring needs. By keeping our overhead low, we can keep our prices low, too. No matter what kind of look you want for your flooring, we have something that will fit your budget. Quality flooring doesn't have to mean that it breaks the bank. Even though our prices are low, the quality of the products we sell is high. We work with the best brands in the industry to bring you flooring in every style and material, whether you're looking for a Berber-style carpet or a ceramic tile mosaic. And we have options to meet every budget, too. Our North Carolina licensed general contractors can help make your flooring dream a reality by providing expert sales and installation services for your home. Business and homeowners have trusted our team with their home renovation and improvement needs for over a decade. If you need help installing your flooring, or if the flooring is only a part of your project, our experts can help you throughout the process. Cape Fear Flooring & Restoration is also a restoration expert. Water damage, fire damage, mold: we've seen it all and have helped hundreds of home and business owners throughout the Fayetteville region bring their spaces back to normal — or even better than before. Let our experts assess the damage and propose a restoration plan that will fit your budget and your timeline. We have a next-day installation service for all flooring we have in stock, and we deliver and install in and around Fayetteville. That way, you don't have to wait forever to enjoy the look and feel of your new flooring. If you are restoring a damaged floor, it's especially important that the installation is done quickly and professionally. That way you can go back to enjoying your home or running your business. When you visit Cape Fear Flooring & Restoration, you have access to the best renovation experts, the best products, the best prices, and, of course, the fastest installation. Why wait for weeks for expensive flooring when you can get it right here, right now, at a price that works for you? 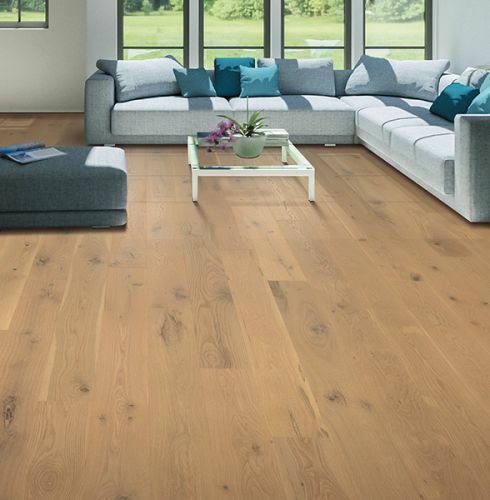 Our financing options on new floors make it even easier to get the floor you want. Visit our store or call us today to learn more about the products and services at Cape Fear Flooring & Restoration!